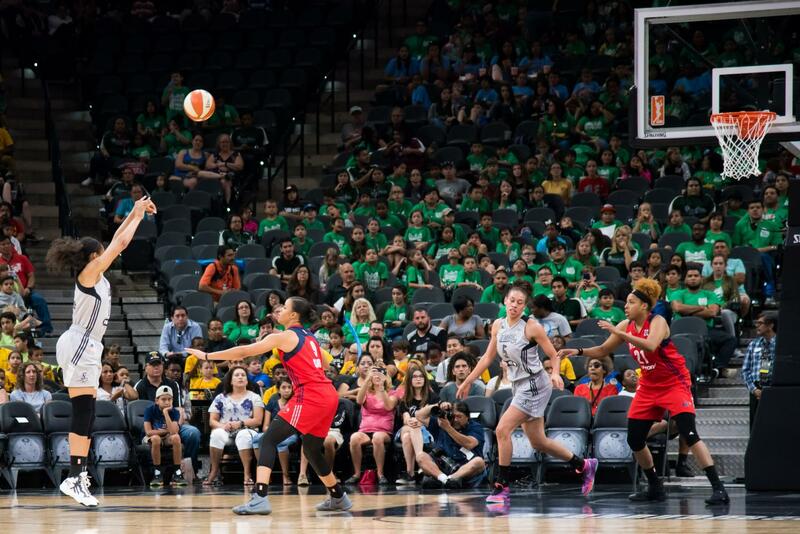 Nia Coffey boxes out an opponent for a rebound in San Antonio's July 25 game against the Washington Mystics. Coffey and the Stars have both struggled this season. ROSEMONT — The Big Ten has its fair share of excellent players, with statistical standouts and future high draft picks littering its rosters. 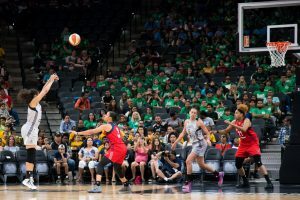 It is no match, however, for the WNBA, where just the top power forwards read like a dominant video game team: Two-time league MVP Candace Parker won the award for the first time in her rookie season; Nneka Ogumwike was once rookie of the year herself and 2015 MVP Elena Delle Donne topped off her young career with a spot on the U.S. Olympic team last year. 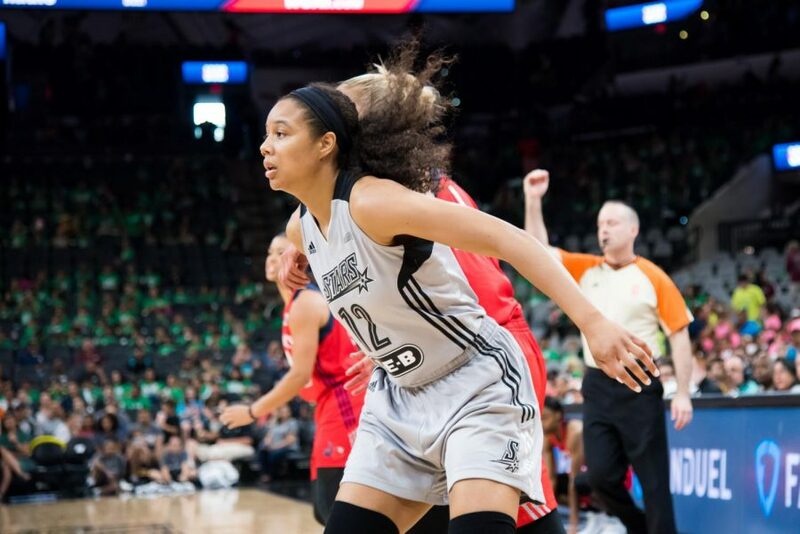 Nia Coffey, the former Northwestern superstar in her rookie season with the Stars, is getting a hands-on lesson on the challenges of the WNBA. Coffey attempts a shot in the July 25 game against Washington. She has averaged just 2.0 points per game this season. Thursday’s effort, a 3-point, five-rebound output in the Stars’ 94-74 loss to the Sky, made for another unspectacular performance from Coffey. Her 3 points were the most she scored in a game in more than a month; the 13 minutes she played were in line with her recent playing time. The game was unique, however, as it represented Coffey’s first return to the Chicago area as a professional. 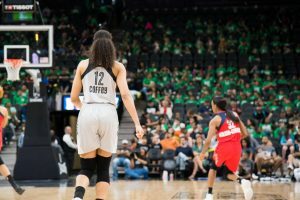 A small splattering of fans behind the San Antonio bench in Allstate Arena wore purple and cheered loudly when she entered the game and scored, and Coffey stopped to acknowledge supporters seated behind the baseline after the game. Brief appearances as a role player belie Coffey’s talent and college success. Likely the best player in NU women’s basketball history, she was a four-time All-Big Ten first team selection and averaged a double-double her senior season. Coffey was taken No. 5 overall in the WNBA Draft in April, at which point Johnson told The Daily that Coffey would be given an opportunity to play right away. ESPN analyst LaChina Robinson lauded Coffey ahead of the draft, calling her possibly the player “who could make the biggest jump from college to what she will eventually become as a pro.” Robinson, however, couched her enthusiasm by predicting that Coffey would need time to move to the ‘3’ position, where her game is best suited professionally. Johnson added at the draft that Coffey’s playing time would hinge on the rookie’s ability to “develop and make that transition” to the professional game. That progression has been difficult even for players more touted than Coffey, like her San Antonio teammate Kelsey Plum. A No. 1 overall pick who set the all-time NCAA scoring mark, Plum has averaged fewer than 8 points per game this season despite being a regular starter. Coffey walks up court in San Antonio’s AT&T Center. She said she’s optimistic for a strong finish to the season, which has six games left in it. Coffey, for her part, has embraced her responsibility as a role player whose main job is to bring energy off the bench. After being the Wildcats’ go-to option offensively for virtually her entire college career, she said she is content to prioritize defense and rebounding. Coffey’s rookie season is winding down on a Stars team that began the season 0-14 and dropped to 6-22 — dead last in the WNBA — with Thursday’s loss. With six regular season games left before heading to Israel to play in the offseason, she struck an optimistic tone, describing her excitement to develop her game and improve. Still, she noted how challenges remain.